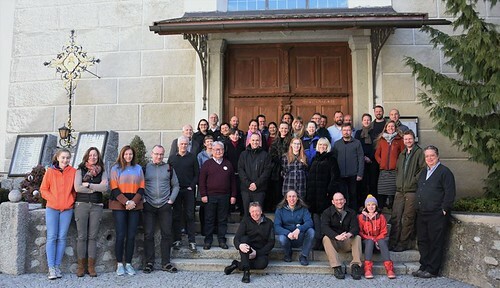 The reportage from the SMF III of INTERACT network follows below. Nina Filippova was participating in the event as a manager of research databases, website and other things of the Mukhrino FS. 🤝Форум менеджеров стационаров сети ИНТЕРАКТ (Stations Managers Forum III) успешно начался, опишу актуальную информацию из программы первого дня. 🤝После приветствий и представления всех участников (около 50 человек, включая менеджеров и другие участники программ сети) и краткого обзора предстоящей работы (о программе писала выше) началась собственно программа SMF. 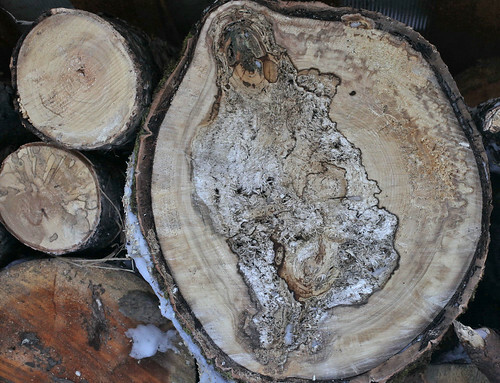 Mukhrino still relies on traditional source of energy, which is stored for us for decades by plants in wood, for heating the houses and sauna and fire-cooking in summer. Only old dead or dying trees in the station vicinity are logged, mostly aspen and birch with minor part of conifers. 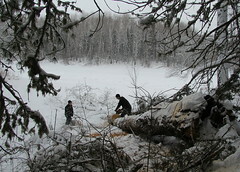 The firewood preparation is quite laborious work, starting from falling and chainsawing the trees in autumn to transporting the stumps and chopping them near the house in winter. It is commonly managed by our watchman and logistics manager with help of other workers and volunteers. I am not sure about the numbers but about 50 cubic meters of firewood is prepared every year for the station’s needs. That is the numbers. 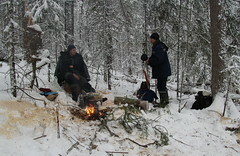 There is the spirit and the poetry too, if you like, that remind to us about traditional living and closeness to nature. That is what we usually offer to volunteers inviting them to firewood works in Mukhrino 🙂. For us, there is also some resource management practice and need, as we want to spend our resources of wood sustainably in years to come. Although presently we rely mostly on our intuition rather then land-planning and partitioning of forest functions around the stations. 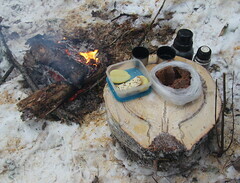 Below some pictures of our routine firewood preparation venues. Good news! The first publication about global short-term TeaComposition expriements come up recently (follow the link). It shows some conclusions on key drivers of decomposition dynamics across the globe (the map of field sites where the experiments were conducted is really impressive). 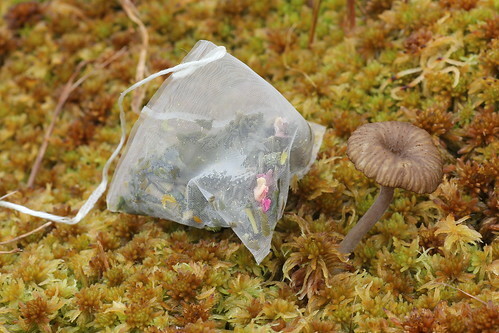 Citizen science could provide large-scale data about ecosystem dynamics in short time, as it is with the project on decomposition dynamics coordinated by TeaComposition initiative (http://www.teatime4science.org/citizens/). The project was supported by INTERACT and many stations launched their experiments with tea bags including Mukhrino FS in 2016. 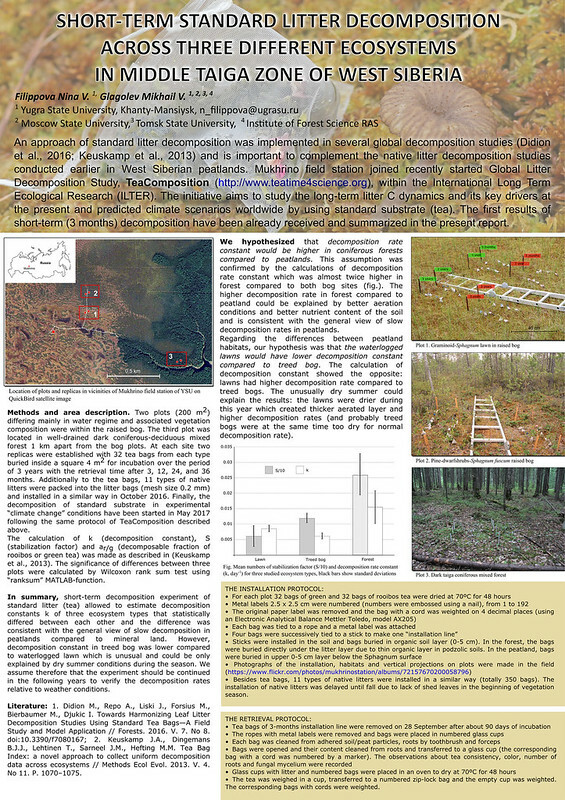 Previously we presented the first results on our local short-term experiment in Mukhrino in a poster (WSPCC-2017) and also a full paper will come soon in WSPCC-2017 / IOP conference series about these results. The other collected data are under analysis and it is very interesting to see what the results would be. If you are interested in the research in this field, please join us in litter decomposition adventures! The photographs and the map show a sad nature conservation story issue with a happy end. The Mukhrino station had been under threat of the newly constructed oilfield road coming right through the experimental area (crossing boardwalk path near its beginning close to forest) and going from the North to the South across Mukhrino bog. Yes, that is good for transportation to the station, one could say. But for everyone born with some addiction to wild nature that is disturbing news. And actually we know that the road constructed across a peatland ecosystem would create too much disturbance and quick shift in communities due to change of natural hydrological regime. This would add influential anthropogenic factor to the whole ecosystem monitoring observations which are currently held in intact conditions. Well, apart from our bad feelings and our poor forecasts we didn’t have the rights to change the plans of the oilfield company as the land was not legally assigned to the University up to date. There was some atempt to do so but without success due to lots of bureaucracy. But thankfully we have good news. There was some call for help from MFS, and the comission from the government people, University and the oil company administrations decided to take the road 2 km aside of the station to the Western part of the bog. Even though there was already an exploration profile and some other work already done to prepare the road construction in its previous direction. Thereby we are celebrating a small victory in conservation of some piece of intact nature surrounding the station. Dull weather conditions like this quite matching your fillings when you see the exploration markings (10 m apart from the boardwalk) of a new planned road. A recently made exploration clearing crossing the boardwalks; now it is abundaned and all works moved to the newly accepted position. The red line shows a newly planned road, the yellow line – its previous position across the MFS area. A thin red line marks the boardwalks. This winter finally collected enough snow to cover the surface by clean smooth cover, that is especially well seen in open areas like bogs. We made a routine check to Mukhrino. Our logistic manager Jaroslav left the post and now the are some inconveniences due to personnel change which will be hopefully solved soon. 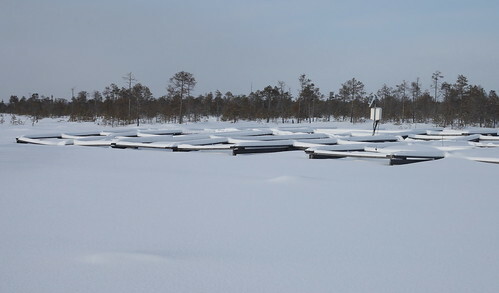 It is interesting to see how the snow covers the open top chambers installed in the climate manipulation site. There are some chambers covered by snow completely and some with empty space inside the chamber due to melt and in some cases wind turbulences. These differences are imporant and should be checked if we wand to model climate change effects reliably. INTERACT II has been approved, so researchers interested in visiting Mukhrino Field Station between March 2017 and April 2018 should apply for funding their visits till 18, December, 2016. Please register at interaccess to apply. On 24-25 October Tomsk State University hosted the workshop “Impact of climate change on Siberia: detecting, understanding and predicting Siberian environmental change and its societal consequences”. Yugra State University was represented by the head of UNESCO Chair “Environmental Dynamics and Global Climate Change” Elena Lapshina.